A contemporaneous painting of the siege of Vienna by Frans Geffels (1683). It was on 9/11, but not in 2001 and not in New York. Rather, it was September 11, 1683, when Europe stopped the invading Islamic armies at the Gates of Vienna, marking the end of the Islamic conquest of Europe. That is, until now. 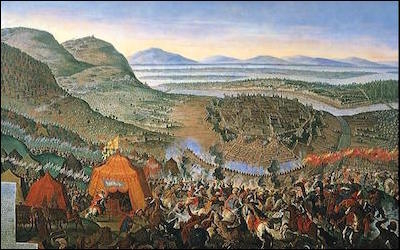 The Battle of Vienna took place after the city had been besieged by 300,000 jihadis of the Ottoman Caliphate for two months. Behind the city gates was the army of the Holy Roman Empire, led by the Habsburg Monarchy and aided by Catholic legions from Poland and Lithuania. Today, no Turkish troops besiege Vienna, but Islamism and the idea of the Islamic Caliphate still haunt Austria. Last week, I was invited by the University of Vienna to a conference whose title the hosts had borrowed from my book Chasing a Mirage: The Tragic Illusion of an Islamic State. Academics from Maldives to Malaysia, Indonesia, Israel, Turkey, Tatarstan and Egypt joined Nigerian, Senegalese and UK professors to discuss and debate issues, leading to some spirited exchanges. More than four centuries after the Turkish siege of Vienna, the idea of an Islamic Caliphate still haunts Austria. A week is too little time to get a feel for a city, let alone a country. But through interacting with graduate students at the 600-year- old university and judging from their questions, I sensed a genuine fear of Islamist ideology in Austria. (And, I was told, in the Czech Republic, Poland, Hungary and Bulgaria as well). Leading up to the conference, the Islamist factor was key in the photo-finish, May 22 Austrian presidential election. Independent candidate Alexander Van der Bellen barely defeated Norbert Hofer of the right-wing anti-Islamist Freedom Party, by 50.35% to 49.65%. A poll published by the OGM institute in 2015 found 58% of Austrians felt "radicalization" of the nation's Muslims was underway. A string of crimes committed by newly arrived Muslim refugees has enhanced that fear. Earlier this month, as reported by the New York Times, a grandmother of three, walking her dog, was raped while a 10-year-old boy was sexually assaulted at a public swimming pool. A 21-year-old student was gang raped in Vienna's famed Prater Park and another 54-year-old woman beaten to death on the street. 58% of Austrians say radicalization of their nation's Muslims is underway. Next door in Germany, the infamous sexual assaults in Cologne on New Year's Eve helped to trigger the rise of the Alternative fur Deutschland (AfD) party. The German philosopher Marc Jongen, associated with the AFD, recently talked to the Times of India and raised the "cultural factor" of recent immigrants. "They come from Muslim countries – a different cultural background. ... They will keep their way of thinking, their habits – and we see a problem in it. Muslims have been here for decades but have had problems to integrate," he told the newspaper. At the university conference, a young, second-generation Austrian woman of Turkish descent asked me how one could tell if one had integrated into Austrian society or failed to do so. I suggested one litmus test for Austrian Muslims was relatively simple: "When you think of the 1683 Siege of Vienna, if you feel for the besieged inside the city walls, you have integrated. But if you cheer for the Ottomans, you have not." There were a few gasps, then complete silence in the room. Later, the student came up and shook my hand. "Thank you," she said to me as she and her mom beamed ear to ear.